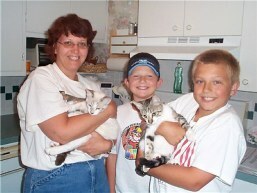 MIKO AND MOOSHU WERE ADOPTED SEPTEMBER 1, 2003! Hi! Just wanted to give you an update on the boys. They are doing great!!! and we love them so much!!! Poor Mooshu didn't fare very well in the car, though. He did end up getting sick. He must have eaten shortly before we picked them up, because he lost quite a bit of food. They went to the vet yesterday and he was quite pleased with the paperwork you sent with us. And he did hear from the vet in Red Bank as well. Anyway, they have adjusted tremendously. We let them roam a bit when we got home and then kept them in one room for the first night. Then Tuesday we let them roam the house and they did so well that we are letting them free all the time. They are so lovable and so cute and we just love them!!!! 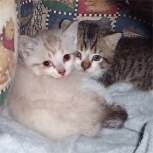 Miko and Mooshu are brothers who were rescued from the outdoors and brought to a foster home at the age of 5 weeks old. They are now about 16 weeks old but smaller than they appear in the picture - a petite pre-teenage girl is holding them. 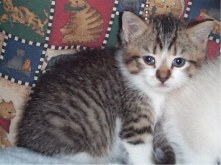 They are exceptionally friendly and affectionate kittens who crave human attention. Miko will snuggle at any time. Just pick him up and he melts into your arms. Mooshu will sqirm away if he has his mind set on playing but once he tires out, he is right there on his foster mom's lap, snuggling up with his brother. They purr contentedly in stereo as they fall asleep for their nap. They are both very curious and like to stick their noses into whatever is going on. 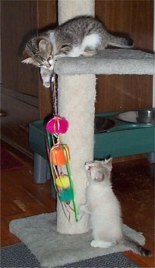 They play together nicely and are very comical to watch. 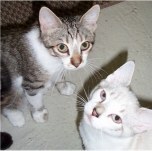 Miko and Mooshu had been separated for a day as they had been rescued individually and later reunited. They were so happy to see each other again and they remain a bonded pair. They will need to be adopted together so they can stay together forever. 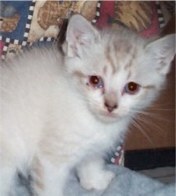 Miko was found on May 9, 2003 in a feral colony. He was about 5 weeks old and had an eye infection which has since cleared up. Miko was very scared coming into his foster home but it was soon apparent that he preferred his foster mom carrying him around over being in his cage all alone so he did lots of snuggling on his first day. In the evening he had even relaxed enough to eat some baby food, use his litter box and play with a toy mouse. Some of his siblings had been spotted with the feral colony so we are hoping they will be found and reunited with their brother. Miko looks like a snow bengal and his eyes have remained blue. The next morning, at the feral food bowl, Mooshu was spotted and whisked off to the foster home to join his brother, Miko. They were thrilled to see each other. Miko had been terribly lonely all by himself. We were hoping to get the rest of the litter. Unfortunately, the third kitten remained elusive, was spotted once darting into a vacant building, and then was never seen again.